The day was hot and dry. Our mission team spent the night with a Kenyan family near the base of Mount Kenya (Kenya’s largest mountain). The roosters and cows announced the rising sun, jolting us from our peaceful slumber. Suitcases had been packed the night before and were settled by the door. It was time to go. 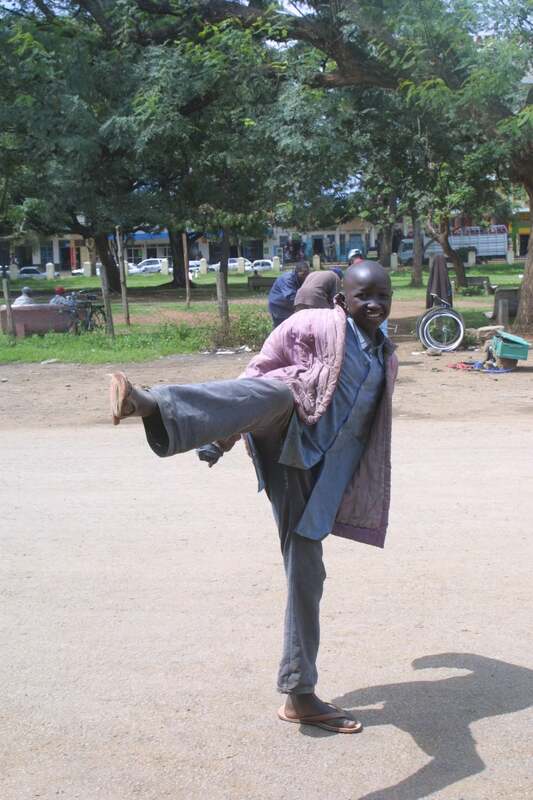 The outdoor air was brisk; we each carried a bag and headed towards Matanya Primary school. 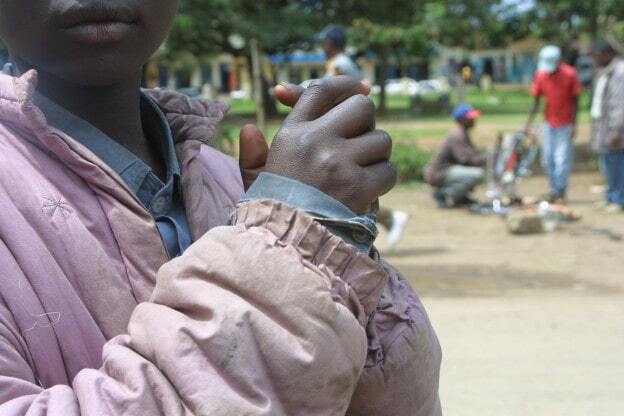 A barefooted child stood outside of the classrooms with a metal rod and a piece of rusted steel clutched between his fingers. THIS was the school bell. The rod hit the steel, sending an urgent rhythm through the air; children poured from their dirt floored classrooms. PORRIDGE TIME! 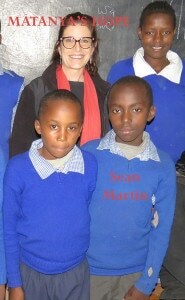 Every year, Matanya’s Hope raises money to feed children from 3 rural, impoverished primary schools. This cup of hot porridge is often the only nourishment a child may have for the entire day. 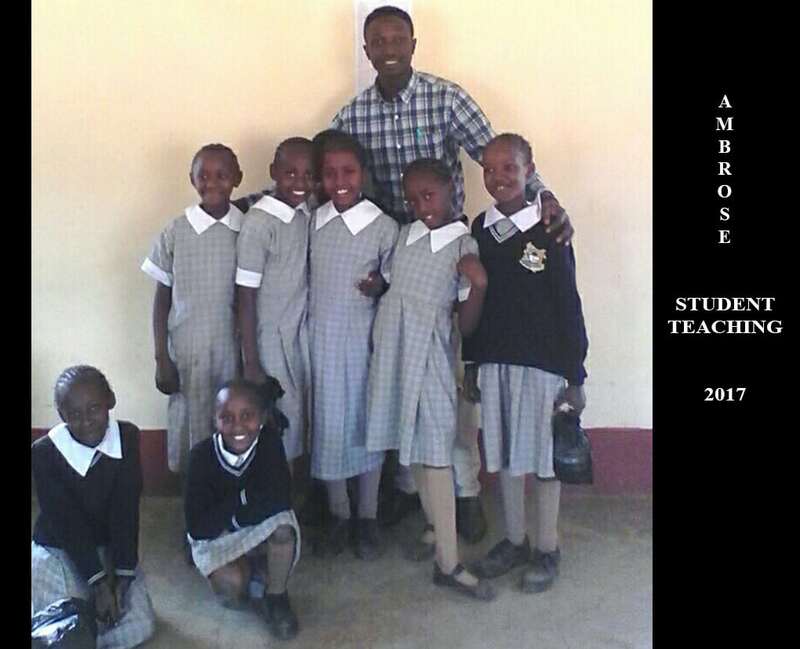 This year, Jonah, a Brown University student raised funds to feed the 250 children from Matanya Primary a nutritious meal of porridge every day of school. 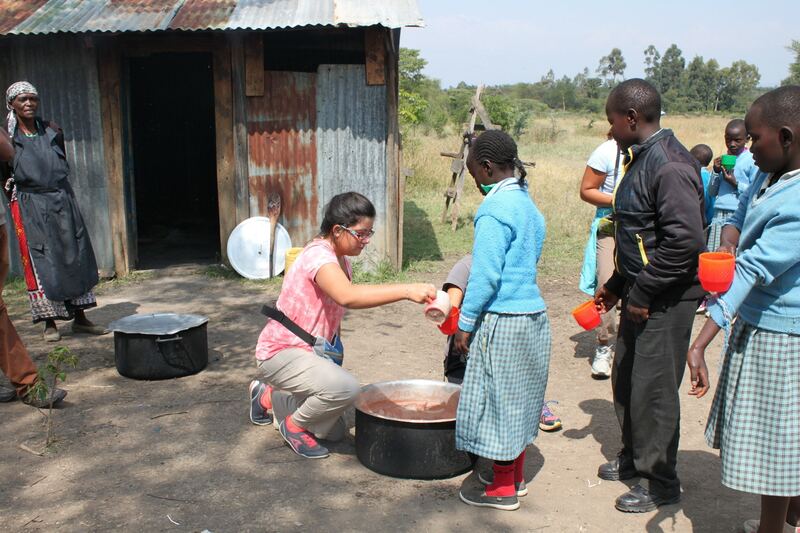 Mission participants embrace the opportunity to serve porridge to the children. 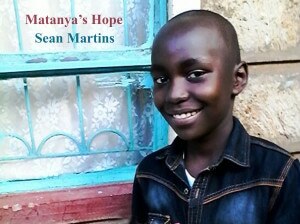 After Mary and the rest of the Matanya’s Hope team served porridge to the children, we met with those most needy. Bare footed children lined up outside of the dark stone hallway where we spread out donations of shoes, clothing, blankets, school supplies, toothbrushes, toothpaste, soap, nutrition bars and more. Children in torn and tattered clothes waited with anticipation for a pair of trousers, a shirt, underwear, or a jacket. 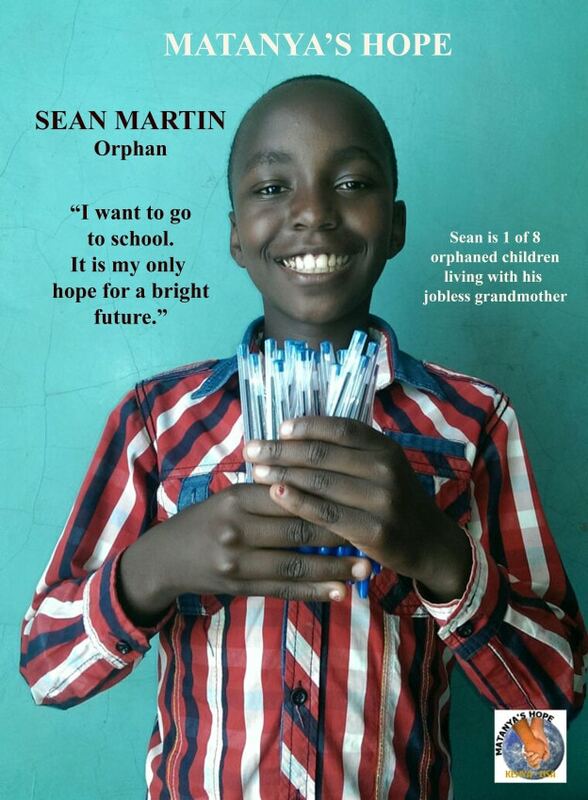 Many needed book bags, blankets… pencils, pens… soap, toothbrushes and toothpaste. The need was great. Mary understood this better than anyone! Just years before, in 2007, she too, had nothing. Her parents’ home was burned and her family lost everything. Broken and desperate, they came to live with an uncle in Matanya. Within weeks, he abused them and forced them out. Minutes passed into hours and an exhaustion spread throughout our team. Water (a very precious commodity) and a bite of Ellen’s Quest bars helped us press on. Donations came to a bitter sweet end. A few new soccer balls flew from feet to heads to air. Cameras clicked. We played with the kids and could not have asked for a better day! Later that night, I sat cross legged on my bed preparing to listen to Mary’s story. I could not help but notice that she was dressed well. Her hair framed her youthful face in plump, fresh braids revealing the majesty of the setting sun reflected on her high cheek bones. The nice looking tablet she was using was nearby. Mary sat on the floor against the wall. Her knees were drawn up to her chest. 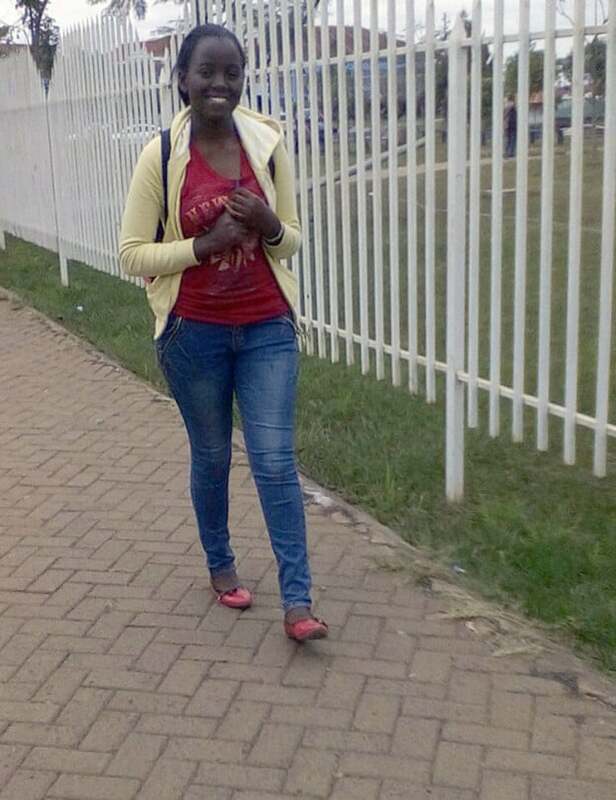 I knew I would hear Mary’s story, but I was prepared to confirm my inclination that she was ok. That perhaps she needed little help outside of school fees for college. Mary spoke; I filled with shame as her story unfolded. I cried with her as she spoke about being displaced, losing every thing and being emotionally abused. “It was back in the year 2008 when life gave me a hard blow that until today I have not been able to let go of it in my mind. We had just celebrated the Christmas festivities with my grandparents and we were on our way back home when chaos broke out in our country along tribal lines. We were informed that our home town was very unsafe and hence my uncle offered us shelter. We hoped that all would be well soon. After two weeks of continued violence, we received terrible news that our belongings had been looted and our home was burnt down to ashes. This was the most painful time of my life. We remained at my uncles place for two more weeks; he felt that we were a burden to him. My uncle’s became rude and really abused us. We had to move. My dad tirelessly looked for a job; he was without a single coin but he found a small, single room nearby. His only choice was to now go daily to search for employment on people’s farms, where he would work from sun up to sun down for less than $1 a day. Through God’s mercy, he later found a better job at a hardware shop. The lady owning the hardware place offered me and my younger brother school uniforms and stationaries and we joined school. By that time, we had been out of school for more than half of a term and this meant that we were so much behind in terms of our studies. I felt so discouraged, as if I would never make my dreams of being a lawyer true due to the situation back at home. My mother had been adversely affected by the turn of events and would often suffer from asthma attacks. She depended entirely on inhalers and other prescribed medicine. When she could, she would work as a casual laborer at the same farms my father worked on – from sun up to sun down – and would bring home $1 a day. Life was very painful. I remember sometimes, especially before my dad got the job, we would miss meals. We slept hungry, on a very thin layer of foam with a very thin blanket. We would anxiously wait for the day to dawn because the place was so cold. Back in school, I worked tirelessly and was able to catch up with my studies. I was blessed with massive support from the teachers who made me see the need to work even harder so I could raise my family out of the state of poverty. After I changed my attitude, I saw my background state as my greatest inspiration to work extra hard. God did make way for me out of nowhere. I met Matanya’s Hope and I got sponsored for my studies. 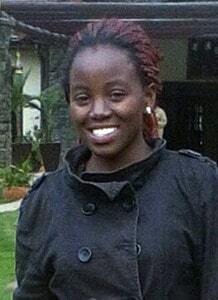 Being sponsored by Matanya’s Hope is what changed my life and made me believe that nothing is impossible with God. Mary’s facade melted away as we continued to speak. “Is it difficult for your parents to provide food?”, I asked. She buried her face in her arms. Are your parents educated, I asked. So, you will be the first? I was still confused about something. “Your tablet is nice”, I told Mary. What do you want for your future, I asked Mary. 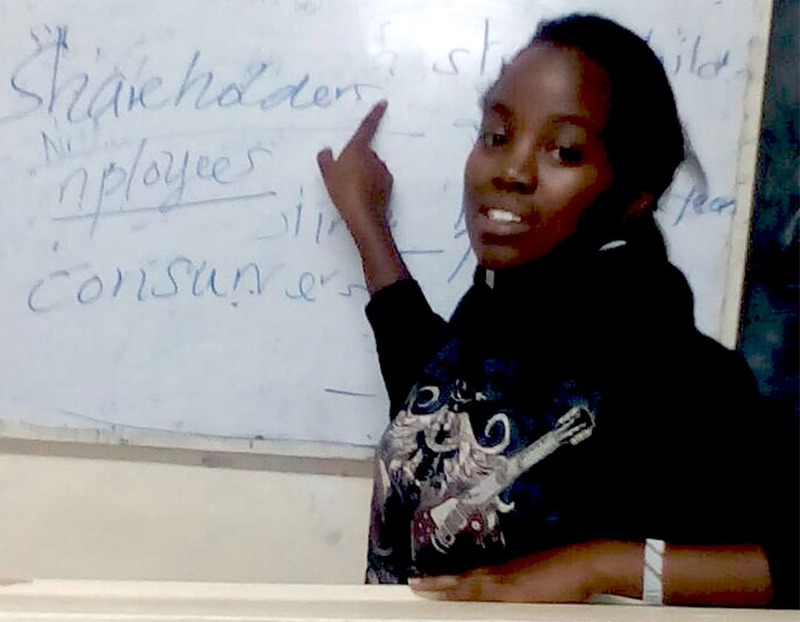 Sponsorship has given Mary a promise of hope as she continues her education. It goes far beyond any financial commitment or gift; it offers our children a chance to dream again. 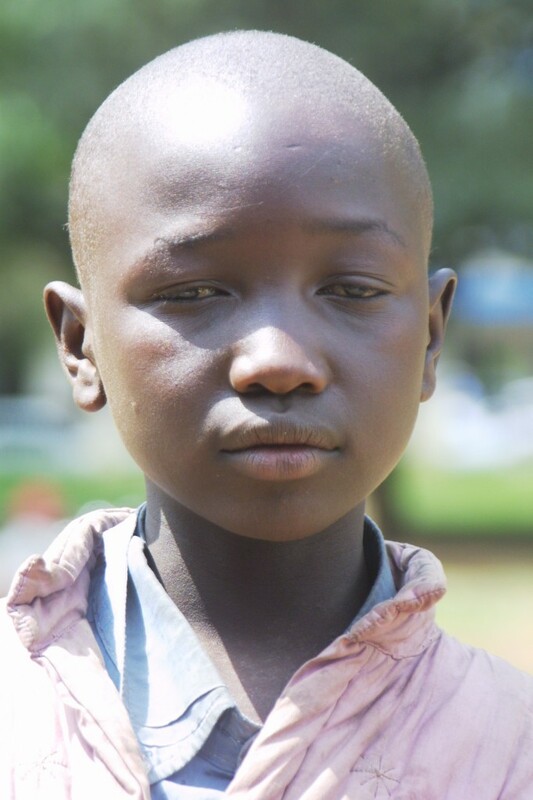 This entry was posted in The Children, To Our Sponsors, Uncategorized and tagged Africa, Charity, Donate, Donation, East Africa, Educate, Education, feed a child, Girl Child, Help, Hope, hopeless, hunger, Hungry, Kenya, Matanya's Hope, mission, NGO, Non Profit, Not for Profit, orphan, Poverty, school, sponsor, Sponsor a child, Sponsorship, success stories, Support, tribal clashes on May 21, 2017 by Michelle Stark. 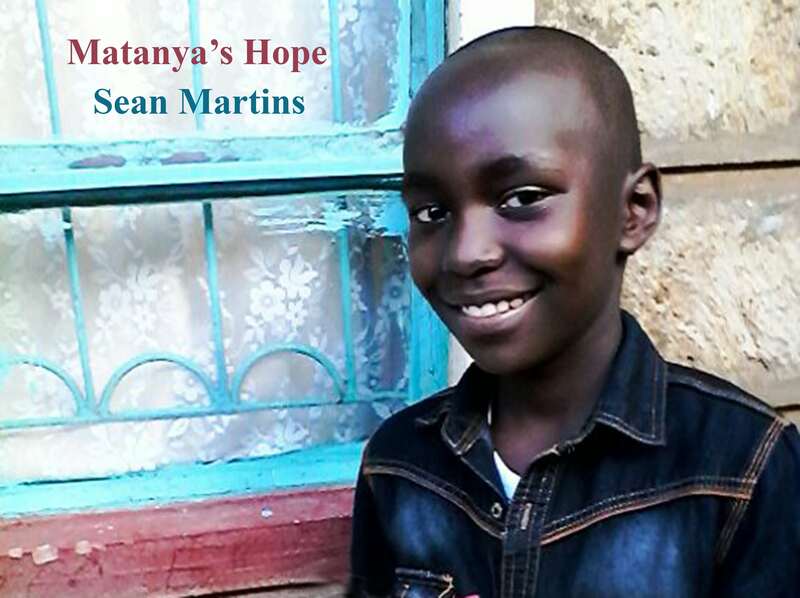 This entry was posted in Matanya's Hope, Success Stories, The Children, To Our Sponsors, Uncategorized and tagged Africa, Charity, Education, Feed, Hungry, Kenya, NGO, Non Profit, Orphan. 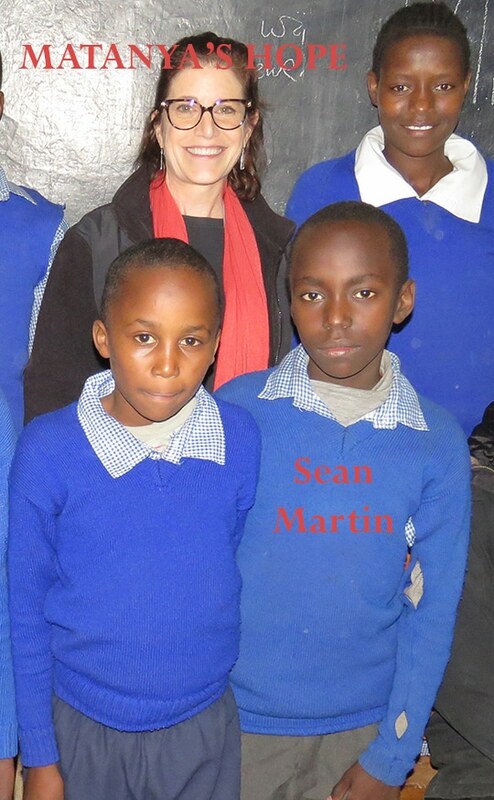 Help, school, Sponsorship on March 4, 2017 by Michelle Stark.